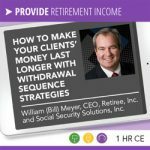 William (Bill) Meyer, CEO, Retiree, Inc. and Social Security Solutions, Inc., is a nationally recognized expert in retirement income withdrawal strategies and Social Security claiming strategies. William Meyer developed Retiree Inc. and Social Security Solutions with Dr. William Reichenstein from Baylor University. It is the leading retirement income management and withdrawal software for financial advisors, IncomeSolver.com. Throughout his career, William Meyer has looked for new ways to deliver higher quality advice to people in retirement. He has a unique combination of experiences in leading the design and launch of innovative client centric services and products, as well as leveraging technology in service offerings. Early in Bill’s career, he learned financial planning techniques for the affluent, and has strived to apply those insights to all households regardless of wealth. He has a track record of successfully developing products and services in executive leadership roles at H&R Block, Advisor Software, and Charles Schwab. He is a former Trustee of the Securities Industry Institute at Wharton. Learn how to beat the “conventional wisdom” used to generate retirement income for your clients in this webinar presentation. For more on this subject by Bill Meyer you may take this course for CFP®, CRC&reg, ASPPA, American College, and other continuing education credits here. William (Bill) Meyer is the presenter for two of the nine broadcasts in our RETIREMENT Smart educational series for pre-retirees. He responds to the question many pre-retirees ask, “When should I take Social Security?” in the second webinar course, discussing hour retirees can maximize their benefits, how to file, and how to avoid costly mistakes and common traps. Bill is also the presenter for the ninth course in the series, “How do I make withdrawals from retirement savings to minimize taxes and penalties?” In this webinar he addresses exceptions to December 31st required beginning dates, the tax implications of distributions from IRAs and early distribution rules, and the election and application of tax withholding rules. Bill has been the featured speaker at national events, and recently testified before the United States Senate Special Committee on Aging. As a thought leader in Social Security claiming strategies, Meyer shared four ways the Social Security Administration could help Americans make better Social Security claiming decisions. Bill Meyer was the only independent business owner asked to testify on the topic. You may get his full testimony to the committee at this link. 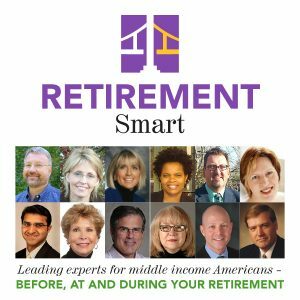 Retiree Income products developed by Meyer and Reichenstein have been featured in national publications such as the Wall Street Journal, SmartMOney, The New York Times, Kiplinger, InvestmentNews, Chicogo Tribune, Bankrate, Inc., and more. Bill Meyer earned his Bachelor of Science degree in Psychology from UCLA and his MBA degree from the Anderson School at UCLA. He holds multiple securities licenses. How can you schedule William Meyer to speak at your event? Bill Meyer is an experienced speaker and presenter with a passion for providing industry-leading information to audiences. Bill is available to speak at your retirement meeting, conference or event. Inquire here about having Bill Meyer speak at your conference or event!